Experienced Bryant dealers are known for doing Whatever It Takes to help you out–and financing is no exception. 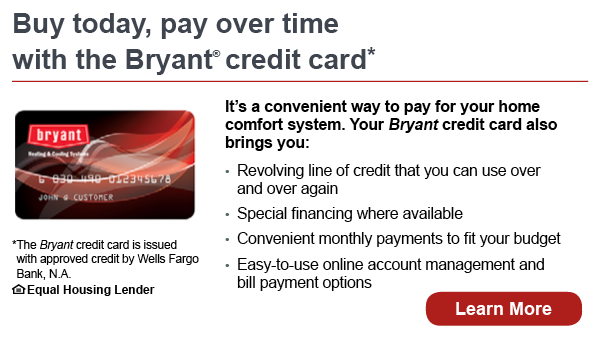 With the Bryant® credit card, issued with approved credit by Wells Fargo Bank, N.A., participating Bryant dealers offer several flexible options for financing your new Bryant product or system. That way, you can invest in your home’s comfort or respond to an unexpected heating and cooling need without breaking your monthly budget. To find out which Bryant financing options are available to you, or to learn about special financing promotions, contact Dormann's Heating & Cooling.